pink, white, and shades of yellow, for Jasmine, Tuberose and Citrus – La Vie is a summery tone poem in pastels. 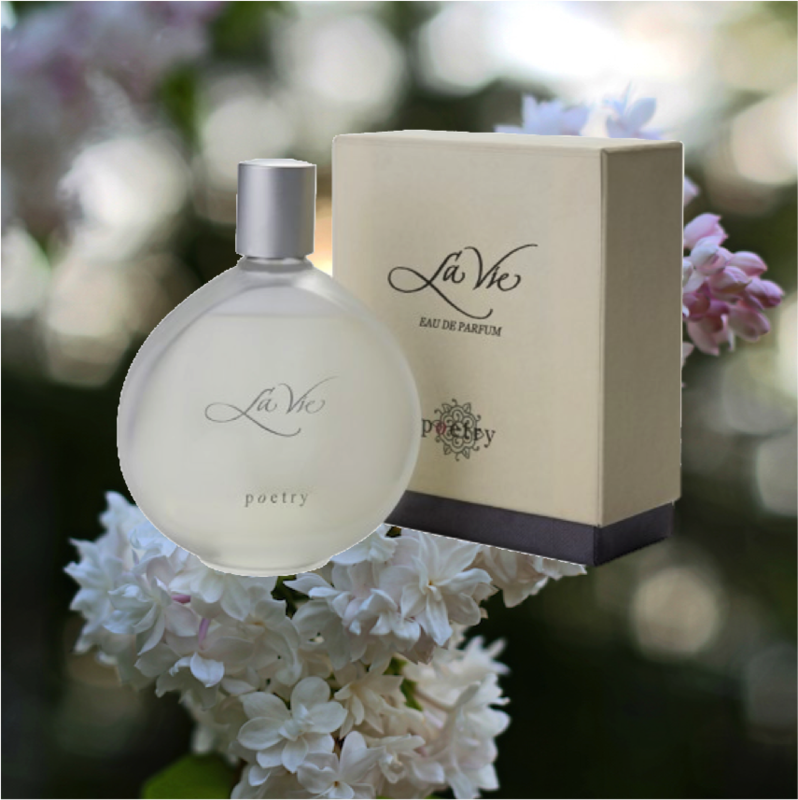 La Vie (meaning “life”) Eau de Parfum is a signature fragrance of Poetry Collection, a lifestyle concept store destination for women (part of the Cape Union Mart Group). It was the first designer fragrance created by Max Millies of Earthgro. Hidden in this seemingly quiet and sedately feminine perfume are hints of decadent Tuberose, surprising Galbanum and intense Jasmine. Starting off with simple, fresh Citrus notes, it becomes more interesting and daring and its base note is Musk. Like life – its name – the perfume is complex, contrasting, filled with surprises – and never boring. Max Millies developed the formula, and Earthgro supplied the perfume itself, the bottles as well as the boxes to Poetry. The top note in this perfume is bright and fresh Citrus, specifically Bergamot. Bergamot essential oil is a cold-pressed essential oil produced by cells inside the rind of a bergamot orange fruit, which looks small, knobbly and green. It is a common top note in perfumes and might remind you a little of Earl Grey tea that contains bergamot essential oil as a flavouring. The middle note is purely floral; Tuberose, Rose, Jasmine and Galbanum. Tuberose (Latin: Polianthes tuberosa), is a perennial plant related to the agaves, extracts of which are used as a note in perfumery. It looks like a white lily and smells creamy and ripely floral, even seductive. If over-used it can smell over-ripe. The multi-petalled flower is a mix of flower shop freshness and velvety opulence. The Victorians forbade young girls of inhaling the scent of tuberose in the fear they might get over-excited. Fragrance specialist, fragrance historian, and perfumer Roja Dove calls Tuberose, the “harlot of perfumery”. Rose (classic rose) is the dominant middle note, which is sophisticated and timeless. Rose may smell aromatic, anise-like, fruity and even like a powdery musk. Jasmine, often found in gardens as a delicious-smelling climber, is a heady, piercingly sweet, almost narcotic fragrance, which can be smelled from far away. The fragrance of jasmine is joined with our culture in the forms of spirituality, tradition and also medicine. There are several species of jasmine but the most common are Jasminum sambac and Jasminum grandiflorum. The Jasminum sambac fragrance has rejuvenating, boosting and energizing properties, while Jasminum grandiflorum is one of the most prominent scents and it has highly unique and incredibly intense aroma. Galbanum has a slightly bitter, bracing scent, to balance out the rich sweetness of the other floral middle notes. Galbanum oil is derived via steam distillation from the resinoid that comes from the trunks and roots of the Ferula galbaniflua plant. The fresh distillation smells like crushed pine needles or pea pods with lemony overtones, very fresh, vegetal and sharp, like snapping the fresh leaves between forefinger and thumb. Because of its “green” smell, one analyst called it “The Wicked Witch of the West”, after the green witch in The Wizard of Oz. The base note is Musk, a woody, earthy, warmly spicy fragrance. Perfumers no longer use the glandular secretions from animals such as the musk deer, an endangered animal, to obtain musk. Nearly all musk fragrance used in perfumery today is synthetic, sometimes called “white musk”, or Muscone ((R)-3-methylcyclopentadecanone C16H30O). Synthetic musk nevertheless can be said to have an animalistic odor, and some people say it smells of human skin. Clips of orange blossom gathering from “Orange Blossom Harvest”, previously on https://vimeo.com/102051756 , Season 3, Episode 4 of FoodieTV. Attribution requirements unknown. Licence: ATTRIBUTION LICENSE 3.0 (http://creativecommons.org/licenses/by/3.0/us/), downloaded at Mazwai.com. Flower photo stills on Photo attribution page.